Human rights based budget analysis projects have emerged at a time when the United Nations has asserted the indivisibility of all human rights and attention is increasingly focused on the role of non-judicial bodies in promoting and protecting human rights. 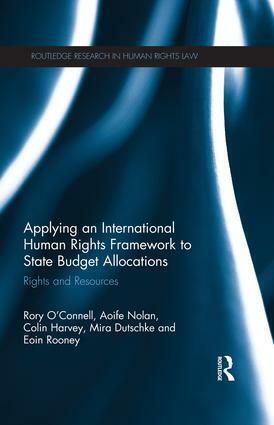 This book seeks to develop the human rights framework for such budget analyses, by exploring the international law obligations of the International Covenant on Economic, Social and Cultural Rights (ICESCR) in relation to budgetary processes. The book outlines international experiences and comparative practice in relation to economic and social rights budget analysis and budgeting. The book sets out an ICESCR-based methodology for analysing budget and resource allocations and focuses on the legal obligation imposed on state parties by article 2(1) of ICESCR to progressively realise economic and social rights to 'the maximum of available resources'. Taking Northern Ireland as a key case study, the book demonstrates and promotes the use of a ‘rights-based’ approach in budgetary decision-making. The book will be relevant to a global audience currently considering how to engage in the budget process from a human rights perspective. It will be of interest to students and researchers of international human rights law and public law, as well as economic and social rights advocacy and lobbying groups.